I have done quite a few ‘Slow Communication’ workshops at Brisbane City Council Libraries, based on the book ‘Snail Mail’. You can read about my slow communication station in my school library here. We’ve not had time in the BCC workshops to make paper, but I’ve shared the process with the participants and publisher of ‘Snail Mail’, Hardie Grant, have kindly given permission for me to share this extract from Michelle Mackintosh’s beautiful book. 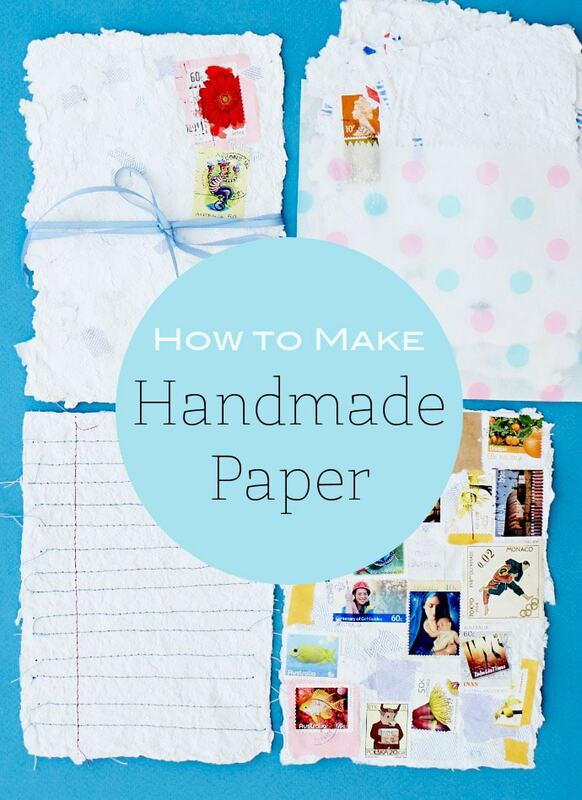 If you have an afternoon free, why not make your own paper? It’s a wonderful way to personalise your post, and is endlessly customisable. You can decorate your paper with stamps, pressed flowers, confetti or gold sparkles, or make paper laced with seeds, so the recipient of your letter can plant it in the garden. 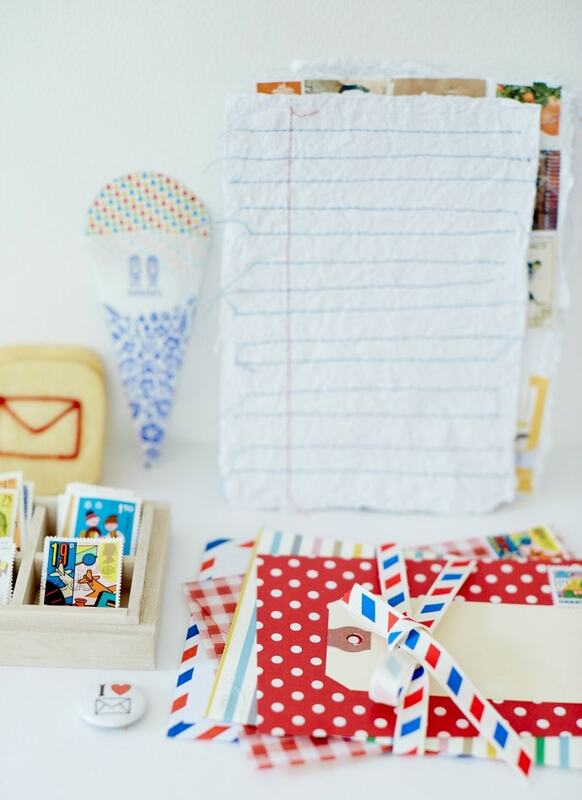 Wherever your creativity leads you, this is a perfect project to get your snail mail looking like no-one else’s. You’ll never buy paper from the store again! 2 x picture frames Choose frames that are the size you want your paper to be – just make sure that the frames are the same size and can sit together. Flyscreen mesh You can buy this at any hardware store. A blender If you plan on making a lot of paper, buy a used blender. Making paper won’t break your good blender, but it can get messy … paper plus water equals gluey goo! Scrap paper You can literally use any paper, depending on what effect you want. A tray This can be an old cat litter tray (preferably one that Whiskers isn’t using). You can even use the sink or a plastic out-tray as long as your frame can fit and be submerged in it. If you’d like to stitch your paper like the example shown, you’ll need a sewing machine. 1. 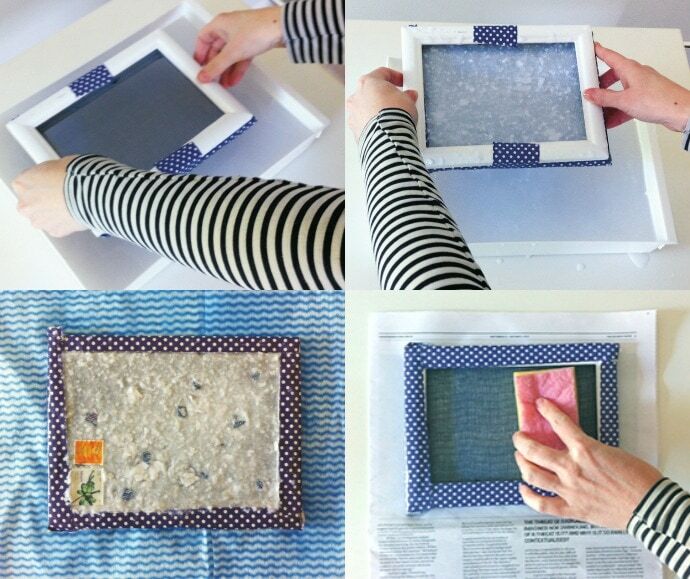 Remove the glass and backing from one frame and cut a piece of mesh a little larger than the entire frame. This will ensure you have enough mesh to stretch and fasten over the opening. Stretch the mesh over the frame and fasten it with staples or tacks. Ensure it is stretched tight across the opening. Cover the edges of the mesh with duct tape, taking care not to let the tape overlap the opening. 2. Stretch the mesh over the frame and fasten it with staples or tacks. Ensure it is stretched tight across the opening. Cover the edges of the mesh with duct tape, taking care not to let the tape overlap the opening. 3. 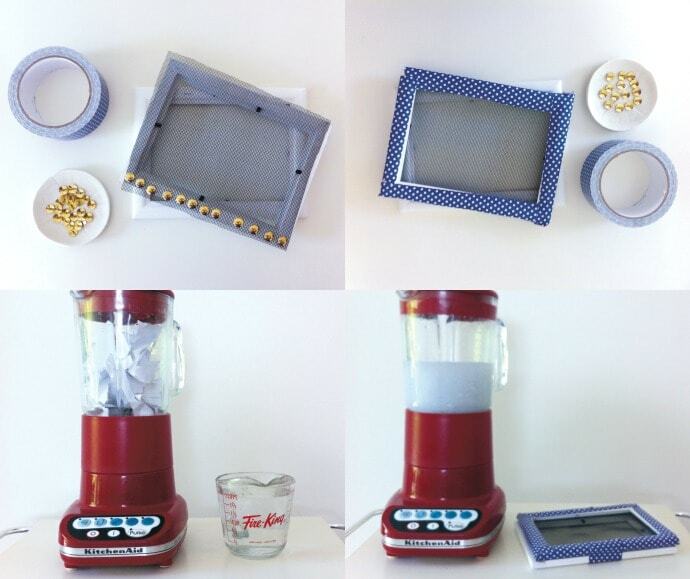 Tear up the scrap paper and place in the blender with enough water to cover completely. You can add extras at this point. For a flecked look, try kitchen spices, herbs, grass or flower petals. Don’t add extras that you want to remain whole, like pressed flowers or leaf skeletons. These will be added later. 4. Blend the paper and water mixture. You can blend for a short time for chunkier paper, or for a longer time for a finer paper. surface out. The meshless side of the frame will keep the pulp in place. 6. Lift the frame from the water, making sure the pulp side is facing up. Let the excess water drain through the frame before removing the meshless side of the frame. 7. Place the frame, pulp side up, on microfibre towels or tea towels (anything absorbent will do, really) to drain for half an hour. At this point, you can add any reserved ‘whole’ extras. Try gently pushing on some pressed flowers or leaf skeletons – whatever takes your fancy. peel off the pulp, which should now resemble a wet sheet of paper. Be very gentle, as it can tear at this stage. Once the sheet of paper is free, leave it to dry on newspaper overnight. Tip: If the paper is buckled, place it under some heavy books once it is dry. Voilà! 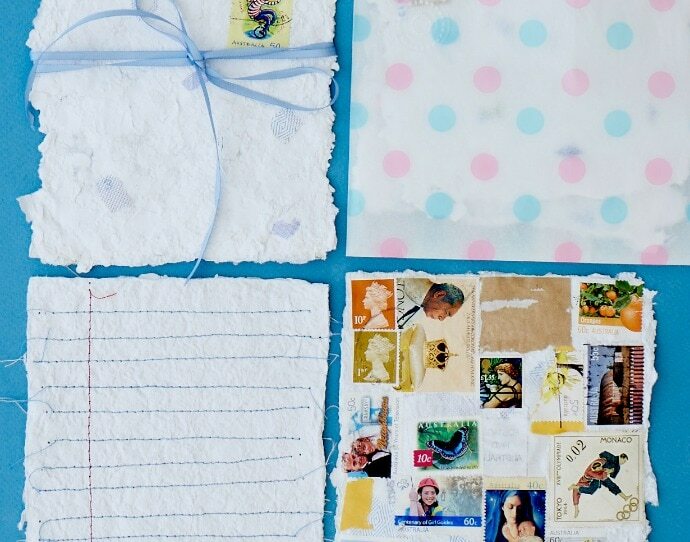 You have your very own handmade paper, which will make your letters to others just that little bit more special! Well I know what I will be making with my year 4 class this term! Great idea for a procedure work sample (beats making jelly hands down)! Oh that’s a GREAT idea!!!! They will LOVE it! You, on the other hand, may regret it!!!! Well I can always hire someone to come in and do the dirty work for me. I have ordered the book from this post because Ellie wanted it!